When travel or lost your way then check your direction by Smart compass – GPS Navigation Map. A Compass can be used for most of your outdoor activities such as travel, picnics, camping, hiking or boating. Navigate your Compass GPS and Weather world faster App and easier with Maps. Over many countries and territories mapped and hundreds of millions of businesses and places on the map. 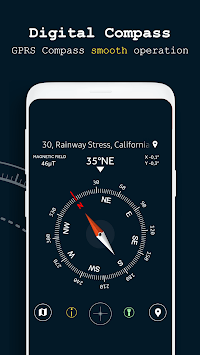 This Digital Compass GPS Pro app provides location saving option maps of all countries in the world and gives the best travelling options along the route. 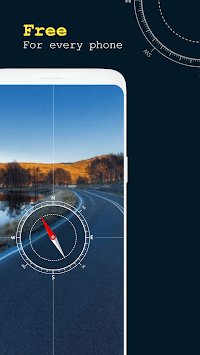 GPS map and Travel Navigation GPS is updated mapping service navigation, draw route for better travel guidance, earth satellite view driving route featured application with advance technology. GPS Compass Navigation is a real compass, which shows device’s real-time orientation to magnetic fields with sensor compass, Google map and GPS navigation. For the smart compassto produce the most accurate results, you must keep the phone parallel to the ground. Navigation and GPS locator you can find the location of your friends, helps you if you lost your way or forgot the address then you can see your current position and also allow to share your current location with anyone family and also track you smart phone. GPS Finder Route Tracking application also has the facility of finding shortest distance route and easy route according to your transportation, route planner for the bus, bikes and walking to any place. - Smart compass app is free and starts fast. It's the most precise of all compass app and supports high definition displays. - Digital compass is a compass free. Digital compass is simple to use; simply use it sort of a real digital compass. Smart compass for android is quite simply showing degrees and true north. Best smart compass permits you to line your directions by rotating the edge for easier and skilled navigation. With Smart compass Digital you can’t lost yourself when you get a new place. Smart compass Digital is a precision smart tool, easy to use, beautiful and completely free for you. What are you waiting for, do not download this Smart compass Digital application to your phone yet. ❖ Compass directions Helps you find your way easily and accurately. You can`t lost yourself when you get a new place. ❖ Digital Design UI Smart Digital Compass uses the current, beautiful digital interface. It has beautiful, pure and practical UI design. Benefits to find the fastest & easy driving route between any two locations around the world, your current location, get easy path between two given destinations etc. 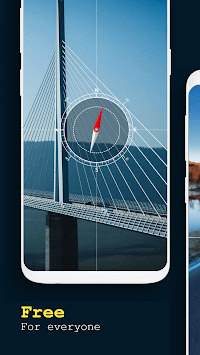 GPS Live Route Earth Map application uses Global Positioning System for tracking route with satellite and street view as this app gives accurate driving route for wherever you want to go. You can search and visit all the important and visiting places in your nearby as user can add any place to their favorite list which later on can be re-visited or share with friends and family. ►To run Smart Digital Compass applications, your phone needs a sensor. Please check that your phone is supported by the manufacturer. If you do not have a sensor, you will not be able to run Smart Digital Compass and that is not our fault, do not underestimate us on the play store. ► Keep the device away from metal objects, machinery and where high magnetic field to avoid false results Applications smart compass, digital compass to help you determine the direction quickly and accurately. ► You can move your phone in space in a ∞ figure pattern until the accuracy turns to high.